Antonio Jacobsen (1850-1921) was born in Copenhagen, Denmark and would become one of America’s best known and celebrated marine painters. He studied at the Royal Academy in Copenhagen before moving to the New York area in the 1870’s. Jacobsen had left Europe at the time to avoid serving in the Franco-Prussian War. 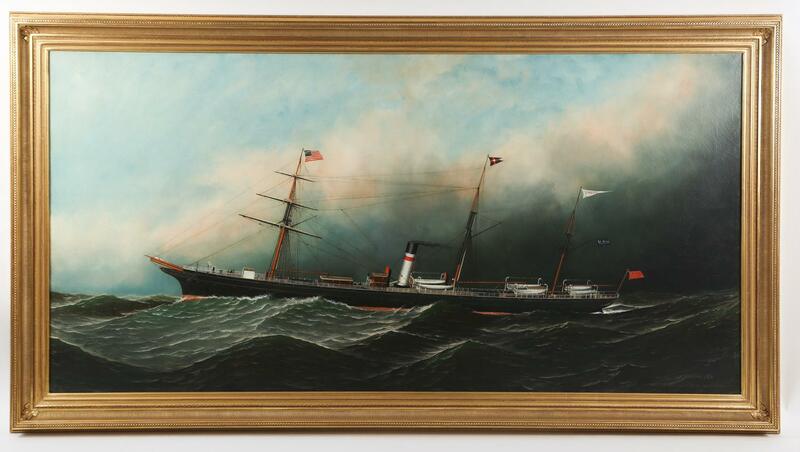 While in New York, the artist executed some six thousand portraits of ships in the city’s harbor and its surroundings between the mid-1870’s and the end of the World War I. Some of the most impressive Jacobsen works may be found at the Peabody Museum in Salem, MA and the Mariners Museum in Newport News, VA. As his stature grew the artist developed a freer hand and his paintings became less inflexible. This is apparent especially when looking at the smaller of the two paintings shown here. Motion and dramatization are favored over attention to small detail. The larger of the canvases is unique to the current auction market in that no comparable work of its size has been seen for some time. The subject of the painting occupies the full extent of the canvas signaling the likely great importance the work would have had at the time of its making.